Not only did the deflecting ditz of the DNC say that Republicans want to deport all immigrants, they want to kick all women out of the country too. I kid you not. Democratic National Committee Chairwoman Debbie Wasserman Schultz also dodged questions on Sunday about whether Democratic presidential candidate Bernie Sanders’ description of himself as a “socialist” would hurt the Democratic Party. She just flat out wouldn’t answer Dana Bash on CNN. This time it wasn’t so much a deflection as an outright refusal to address the question. “He is a self-identified socialist,” CNN’s Dana Bash asked Wasserman Schultz, a representative from Florida. “If he is your party’s nominee, would that social label hurt the Democratic Party’s chances of winning the White House in 2016?” The Debster replied, “This election is going to be decided on what the voters believe is the best choice in their candidate for president who is going to help ensure that their lives can get better. I believe that any one of those candidates is in dramatic contrast to any of the Republican circus performer candidates that are on the other side.” You betcha Debbie! You have your choice of Marxists, communists and socialists for the Democrats. WASSERMAN SCHULTZ: I believe that any one of our candidates will stand in stark contrast, when it comes to the priorities of the American people and how they’re going to make their decision on who they’re going to vote for for President, to any of the Republican candidates. The Republicans are trying to out-right wing each other. Look, between the fifteen Republican candidates who are left — all of whom are trying to out-Trump Donald Trump — by saying, “Yeah let’s kick women. Let’s kick them and immigrants out of this country. Let’s take away health care from women.” … Yes, I think any of the candidates on our side of the aisle … will be chosen and eventually elected as the 45th president of the United States of America because of that contrast. Wasserman Schultz declared that whoever was the Democratic nominee, they would be president. But she wouldn’t mention Sanders by name. Translation: over our dead bodies will Bernie ascend. I still think it will be Biden and Warren on the election stage for these Marxists. 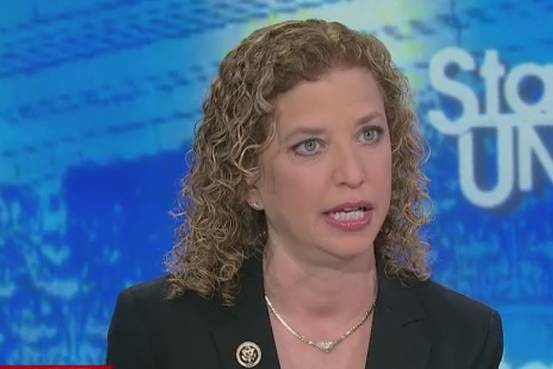 As for wanting to kick all women out of the country, once again, America wants to know if Debbie has been taking some really good drugs or if her curls are too tight. This woman is supposed to be a leader. She’s not. She’s a propagandist – a talking head who never commits to anything. She has the spine of a jellyfish. In other words, she’s your typical Progressive Democrat. Kick all women out… that’s a good one, Debbie. Really. You missed your calling as a clown.